Copyright © 2013-2015 Pivotal Software, Inc. The Spring Cloud Data Flow for Apache Yarn reference guide is available as html, pdf and epub documents. The latest copy is available at docs.spring.io/spring-cloud-dataflow-server-yarn/docs/current-SNAPSHOT/reference/html/. Having trouble with Spring Cloud Data Flow, We’d like to help! Try the How-to’s — they provide solutions to the most common questions. Ask a question - we monitor stackoverflow.com for questions tagged with spring-cloud. Report bugs with Spring Cloud Dataflow for Apache YARN at github.com/spring-cloud/spring-cloud-dataflow-server-yarn/issues. All of Spring Cloud Data Flow is open source, including the documentation! If you find problems with the docs; or if you just want to improve them, please get involved. This project provides support for orchestrating long-running (streaming) and short-lived (task/batch) data microservices to Apache YARN. Spring Cloud Data Flow is a cloud-native orchestration service for composable data microservices on modern runtimes. With Spring Cloud Data Flow, developers can create and orchestrate data pipelines for common use cases such as data ingest, real-time analytics, and data import/export. For more details about the core architecture components and the supported features, please review Spring Cloud Data Flow’s core reference guide. There’re several samples available for reference. Spring Cloud Stream is a framework for building message-driven microservice applications. Spring Cloud Stream builds upon Spring Boot to create standalone, production-grade Spring applications, and uses Spring Integration to provide connectivity to message brokers. It provides opinionated configuration of middleware from several vendors, introducing the concepts of persistent publish-subscribe semantics, consumer groups, and partitions. For more details about the core framework components and the supported features, please review Spring Cloud Stream’s reference guide. There’s a rich ecosystem of Spring Cloud Stream Application-Starters that can be used either as standalone data microservice applications or in Spring Cloud Data Flow. For convenience, we have generated RabbitMQ and Apache Kafka variants of these application-starters that are available for use from Maven Repo and Docker Hub as maven artifacts and docker images, respectively. Do you have a requirement to develop custom applications? No problem. Refer to this guide to create custom stream applications. There’re several samples available for reference. Spring Cloud Task makes it easy to create short-lived microservices. We provide capabilities that allow short-lived JVM processes to be executed on demand in a production environment. For more details about the core framework components and the supported features, please review Spring Cloud Task’s reference guide. There’s a rich ecosystem of Spring Cloud Task Application-Starters that can be used either as standalone data microservice applications or in Spring Cloud Data Flow. For convenience, the generated application-starters are available for use from Maven Repo. There are several samples available for reference. Data flow runtime can be deployed and used with YARN in two different ways, firstly using it directly with a YARN cluster and secondly letting Apache Ambari deploy it into its cluster as a service. The server application is run as a standalone application. All apps used for streams and tasks will be deployed on the YARN cluster that is targeted by the server. These requirements are not something yarn runtime needs but generally what dataflow core needs. Redis - Needed for some persisting runtime data. Rabbit - If dataflow apps using rabbit bindings are used. Kafka - If dataflow apps using kafka bindings are used. DB - we currently use embedded H2 database, though any supported DB can be configured. Unzip the distribution ZIP file and change to the directory containing the deployment files. By default, the application registry will be empty. If you would like to register all out-of-the-box stream applications built with the RabbitMQ binder in bulk, you can with the following command. For more details, review how to register applications. The YARN application is pushed and started automatically during a stream deployment process. Once all streams are destroyed the YARN application will exit. dataflow:>task create --name footask --definition "timestamp"
Overall app status can be seen from YARN Resource Manager UI or using Spring YARN CLI which gives more info about running containers within an app itself. When stream has been submitted YARN shows it as ACCEPTED before its turned to RUNNING state. Ambari basically automates YARN installation instead of doing it manually. Also a lot of other configuration steps are automated as much as possible to easy overall installation process. Generally it is only needed to install scdf-plugin-hdp plugin into ambari server which adds needed service definitions. Ambari plugin only works for redhat6 based systems for now. When you create your cluste and choose a stack, make sure that redhat6 section contains repository named SCDF-1.0 and that it points to repo.spring.io/yum-milestone-local/scdf/1.0. From services choose Spring Cloud Dataflow and Kafka. Hdfs, Yarn and Zookeeper are forced dependencies. Then in Customize Services what is really left for user to do is to add address for redis(as it’s required). Everything else is automatically configured. Technically it also allows you to switch to use rabbit by leaving Kafka out and defining rabbit settings there. But generally use of Kafka is a good choice. We also install H2 DB as service so that it can be accessed from every node. In this section you will learn all about Streams and how to use them with Spring Cloud Data Flow. In Spring Cloud Data Flow, a basic stream defines the ingestion of event driven data from a source to a sink that passes through any number of processors. Streams are composed of spring-cloud-stream applications and the deployment of stream definitions is done via the Data Flow Server (REST API). 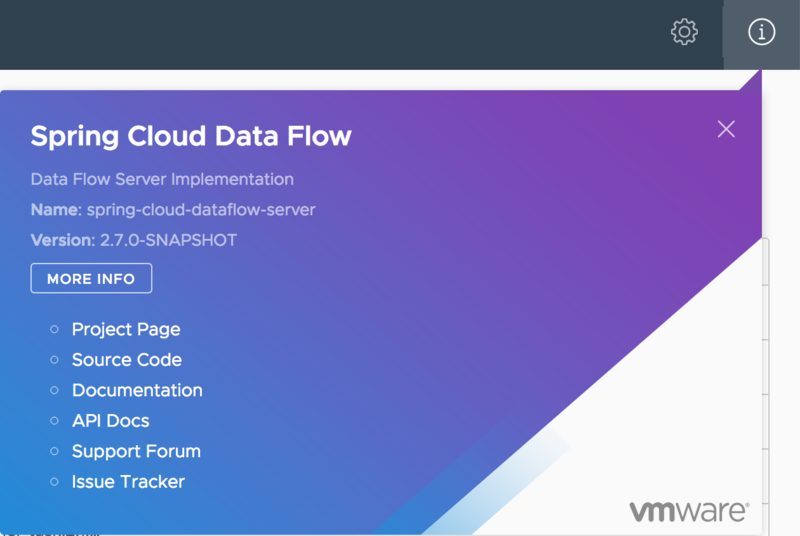 The Getting Started section shows you how to start these servers and how to start and use the Spring Cloud Data Flow shell. To create these stream definitions you use the shell or make an HTTP POST request to the Spring Cloud Data Flow Server. More details can be found in the sections below. The shell provides tab completion for application properties and also the shell command app info provides some additional documentation. If you would like to register multiple apps at one time, you can store them in a properties file where the keys are formatted as <type>.<name> and the values are the URIs. For convenience, we have the static files with application-URIs (for both maven and docker) available for all the out-of-the-box Stream and Task app-starters. You can point to this file and import all the application-URIs in bulk. Otherwise, as explained in previous paragraphs, you can register them individually or have your own custom property file with only the required application-URIs in it. It is recommended, however, to have a "focused" list of desired application-URIs in a custom property file. For example, if you would like to register all out-of-the-box stream applications built with the RabbitMQ binder in bulk, you can with the following command. You can also pass the --local option (which is TRUE by default) to indicate whether the properties file location should be resolved within the shell process itself. If the location should be resolved from the Data Flow Server process, specify --local false. When using either app register or app import, if a stream app is already registered with the provided name and type, it will not be overridden by default. If you would like to override the pre-existing stream app, then include the --force option. In some cases the Resource is resolved on the server side, whereas in others the URI will be passed to a runtime container instance where it is resolved. Consult the specific documentation of each Data Flow Server for more detail. Stream applications are Spring Boot applications which are aware of many common application properties, e.g. server.port but also families of properties such as those with the prefix spring.jmx and logging. When creating your own application it is desirable to whitelist properties so that the shell and the UI can display them first as primary properties when presenting options via TAB completion or in drop-down boxes. To whitelist application properties create a file named spring-configuration-metadata-whitelist.properties in the META-INF resource directory. There are two property keys that can be used inside this file. The first key is named configuration-properties.classes. The value is a comma separated list of fully qualified @ConfigurationProperty class names. The second key is configuration-properties.names whose value is a comma separated list of property names. This can contain the full name of property, such as server.port or a partial name to whitelist a category of property names, e.g. spring.jmx. The Spring Cloud Data Flow Server exposes a full RESTful API for managing the lifecycle of stream definitions, but the easiest way to use is it is via the Spring Cloud Data Flow shell. Start the shell as described in the Getting Started section. This defines a stream named ticktock based off the DSL expression time | log. The DSL uses the "pipe" symbol |, to connect a source to a sink. The Data Flow Server resolves time and log to maven coordinates and uses those to launch the time and log applications of the stream. In this example, the time source simply sends the current time as a message each second, and the log sink outputs it using the logging framework. You can tail the stdout log (which has an "_<instance>" suffix). The log files are located within the directory displayed in the Data Flow Server’s log output, as shown above. dataflow:> stream deploy --name ticktock --properties "app.time.count=3"
See Chapter 19, Using Labels in a Stream. If the stream was deployed, it will be undeployed before the stream definition is deleted. Often you will want to stop a stream, but retain the name and definition for future use. In that case you can undeploy the stream by name and issue the deploy command at a later time to restart it. Let’s try something a bit more complicated and swap out the time source for something else. Another supported source type is http, which accepts data for ingestion over HTTP POSTs. Note that the http source accepts data on a different port from the Data Flow Server (default 8080). By default the port is randomly assigned. dataflow:> http post --target http://localhost:1234 --data "hello"
dataflow:> http post --target http://localhost:1234 --data "goodbye"
Of course, we could also change the sink implementation. You could pipe the output to a file (file), to hadoop (hdfs) or to any of the other sink apps which are available. You can also define your own apps. To demonstrate the data partitioning functionality, let’s deploy the following stream with Kafka as the binder. dataflow:>stream create --name words --definition "http --server.port=9900 | splitter --expression=payload.split(' ') | log"
dataflow:>stream deploy words --properties "app.splitter.producer.partitionKeyExpression=payload,app.log.count=2"
dataflow:>http post --target http://localhost:9900 --data "How much wood would a woodchuck chuck if a woodchuck could chuck wood"
You’ll see the following in the server logs. This shows that payload splits that contain the same word are routed to the same application instance. taps can be created at the output of http, step1 and step2. Note the colon (:) prefix before the destination names. The colon allows the parser to recognize this as a destination name instead of an app name. One can connect to a specific destination name located in the broker (Rabbit, Kafka etc.,) either at the source or at the sink position. This stream receives messages from the destination myDestination located at the broker and connects it to the log app. This stream sends the messages from the http app to the destination myDestination located at the broker. From the above streams, notice that the http and log apps are interacting with each other via the broker (through the destination myDestination) rather than having a pipe directly between http and log within a single stream. It is also possible to connect two different destinations (source and sink positions) at the broker in a stream. In the above stream, both the destinations (destination1 and destination2) are located in the broker. The messages flow from the source destination to the sink destination via a bridge app that connects them. If directed graphs are needed instead of the simple linear streams described above, two features are relevant. First, named destinations may be used as a way to combine the output from multiple streams or for multiple consumers to share the output from a single stream. This can be done using the DSL syntax http > :mydestination or :mydestination > log. Second, you may need to determine the output channel of a stream based on some information that is only known at runtime. In that case, a router may be used in the sink position of a stream definition. For more information, refer to the Router Sink starter’s README. In addition to configuration via DSL, Spring Cloud Data Flow provides a mechanism for setting common properties to all the streaming applications that are launched by it. This can be done by adding properties prefixed with spring.cloud.dataflow.applicationProperties.stream when starting the server. When doing so, the server will pass all the properties, without the prefix, to the instances it launches. This will cause the properties stream.spring.cloud.stream.kafka.binder.brokers and spring.cloud.stream.kafka.binder.zkNodes to be passed to all the launched applications. Properties configured using this mechanism have lower precedence than stream deployment properties. They will be overridden if a property with the same key is specified at stream deployment time (e.g. app.http.spring.cloud.stream.kafka.binder.brokers will override the common property). This section goes into more detail about how you can work with Spring Cloud Tasks. It covers topics such as creating and running task applications. If you’re just starting out with Spring Cloud Data Flow, you should probably read the Getting Started guide before diving into this section. A task executes a process on demand. In this case a task is a Spring Boot application that is annotated with @EnableTask. Hence a user launches a task that performs a certain process, and once complete the task ends. An example of a task would be a boot application that exports data from a JDBC repository to an HDFS instance. Tasks record the start time and the end time as well as the boot exit code in a relational database. The task implementation is based on the Spring Cloud Task project. When using either app register or app import, if a task app is already registered with the provided name, it will not be overridden by default. If you would like to override the pre-existing task app, then include the --force option. dataflow:>task create mytask --definition "timestamp --format=\"yyyy\""
A listing of the current task definitions can be obtained via the restful API or the shell. To get the task definition list using the shell, use the task list command. A user can check the status of their task executions via the restful API or by the shell. To display the latest task executions via the shell use the task execution list command. To get a list of task executions for just one task definition, add --name and the task definition name, for example task execution list --name foo. To retrieve full details for a task execution use the task display command with the id of the task execution , for example task display --id 549. The task execution information for previously launched tasks for the definition will remain in the task repository. Note: This will not stop any currently executing tasks for this definition, this just removes the definition. Out of the box Spring Cloud Data Flow offers an embedded instance of the H2 database. The H2 is good for development purposes but is not recommended for production use. To add a driver for the database that will store the Task Execution information, a dependency for the driver will need to be added to a maven pom file and the Spring Cloud Data Flow will need to be rebuilt. Since Spring Cloud Data Flow is comprised of an SPI for each environment it supports, please review the SPI’s documentation on which POM should be updated to add the dependency and how to build. This document will cover how to setup the dependency for local SPI. Open the spring-cloud-dataflow-server-local/pom.xml in your IDE. In the dependencies section add the dependency for the database driver required. In the sample below postgresql has been chosen. You can also tap into various task/batch events when the task is launched. If the task is enabled to generate task and/or batch events (with the additional dependencies spring-cloud-task-stream and spring-cloud-stream-binder-kafka, in the case of Kafka as the binder), those events are published during the task lifecycle. By default, the destination names for those published events on the broker (rabbit, kafka etc.,) are the event names themselves (for instance: task-events, job-execution-events etc.,). 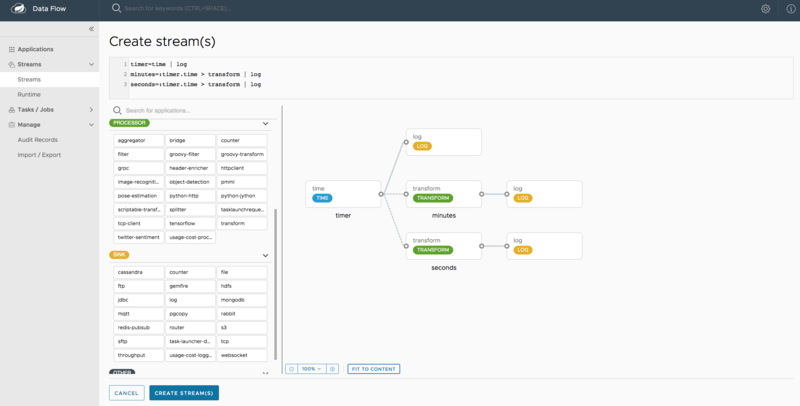 dataflow:>task create myTask --definition “myBatchJob"
dataflow:>task launch myTask --properties "spring.cloud.stream.bindings.task-events.destination=myTaskEvents"
This section describe how to use the Dashboard of Spring Cloud Data Flow. If you have enabled https, then it will be located at https://localhost:9393/dashboard. If you have enabled security, a login form is available at http://localhost:9393/dashboard/#/login. The Apps section of the Dashboard lists all the available applications and provides the control to register/unregister them (if applicable). By clicking on the magnifying glass, you will get a listing of available definition properties. 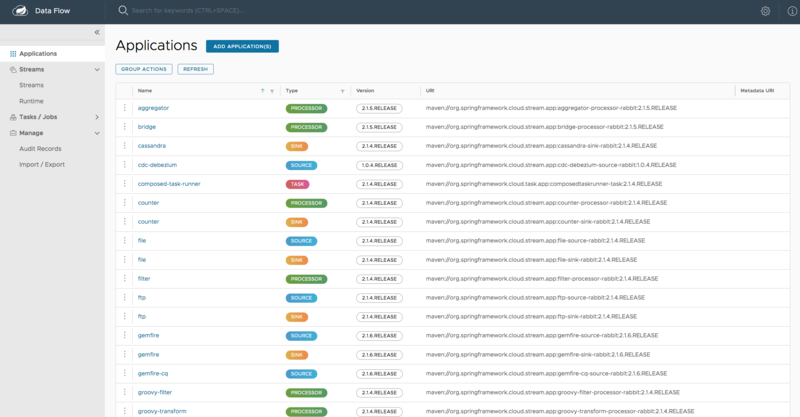 The Runtime section of the Dashboard application shows the Spring Cloud Data Flow cluster view with the list of all running applications. For each runtime app the state of the deployment and the number of deployed instances is shown. A list of the used deployment properties is available by clicking on the app id. The Streams section of the Dashboard provides the Definitions tab that provides a listing of Stream definitions. There you have the option to deploy or undeploy those stream definitions. Additionally you can remove the definition by clicking on destroy. The Create Stream section of the Dashboard includes the Spring Flo designer tab that provides the canvas application, offering a interactive graphical interface for creating data pipelines. Watch this screencast that highlights some of the "Flo for Spring Cloud Data Flow" capabilities. Spring Flo wiki includes more detailed content on core Flo capabilities. Apps encapsulate a unit of work into a reusable component. Within the Data Flow runtime environment Apps allow users to create definitions for Streams as well as Tasks. Consequently, the Apps tab within the Tasks section allows users to create Task definitions. Note: You will also use this tab to create Batch Jobs. View details such as the task app options. Create a Task Definition from the respective App. On this screen you can create a new Task Definition. As a minimum you must provide a name for the new definition. You will also have the option to specify various properties that are used during the deployment of the app. Note: Each parameter is only included if the Include checkbox is selected. On this page you can view the details of a selected task app, including the list of available options (properties) for that app. This page lists the Data Flow Task definitions and provides actions to launch or destroy those tasks. Once the task definition is created, they can be launched through the Dashboard as well. Navigate to the Definitions tab. Select the Task you want to launch by pressing Launch. Task parameters are not typed. The Jobs section of the Dashboard allows you to inspect Batch Jobs. The main section of the screen provides a list of Job Executions. Batch Jobs are Tasks that were executing one or more Batch Job. As such each Job Execution has a back reference to the Task Execution Id (Task Id). In case of a failed job, you can also restart the task. When dealing with long-running Batch Jobs, you can also request to stop it. 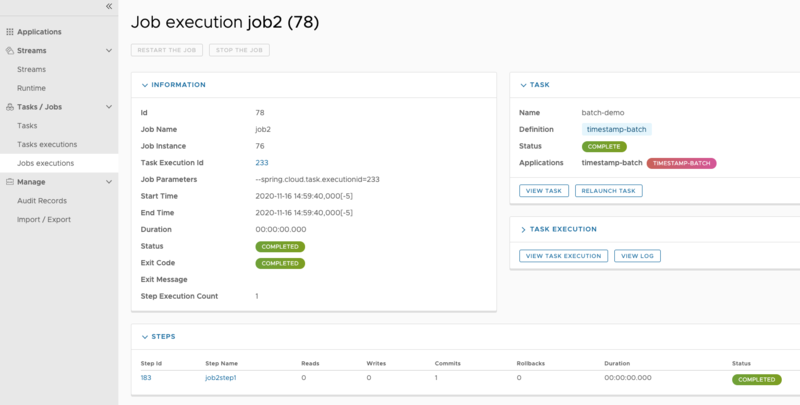 This page lists the Batch Job Executions and provides the option to restart or stop a specific job execution, provided the operation is available. Furthermore, you have the option to view the Job execution details. The list of Job Executions also shows the state of the underlying Job Definition. Thus, if the underlying definition has been deleted, deleted will be shown. The Job Execution Details screen also contains a list of the executed steps. You can further drill into the Step Execution Details by clicking onto the magnifying glass. On the top of the page, you will see progress indicator the respective step, with the option to refresh the indicator. Furthermore, a link is provided to view the step execution history. The Step Execution details screen provides a complete list of all Step Execution Context key/value pairs. In case of exceptions, the Exit Description field will contain additional error information. Please be aware, though, that this field can only have a maximum of 2500 characters. Therefore, in case of long exception stacktraces, trimming of error messages may occur. In that case, please refer to the server log files for further details. On this screen, you can see a progress bar indicator in regards to the execution of the current step. Under the Step Execution History, you can also view various metrics associated with the selected step such as duration, read counts, write counts etc. Using the icons to the right, you can add additional charts to the Dashboard, re-arange the order of created dashboards or remove data visualizations. Spring Cloud is released under the non-restrictive Apache 2.0 license, and follows a very standard Github development process, using Github tracker for issues and merging pull requests into master. If you want to contribute even something trivial please do not hesitate, but follow the guidelines below. Before we accept a non-trivial patch or pull request we will need you to sign the contributor’s agreement. Signing the contributor’s agreement does not grant anyone commit rights to the main repository, but it does mean that we can accept your contributions, and you will get an author credit if we do. Active contributors might be asked to join the core team, and given the ability to merge pull requests. None of these is essential for a pull request, but they will all help. They can also be added after the original pull request but before a merge. Use the Spring Framework code format conventions. If you use Eclipse you can import formatter settings using the eclipse-code-formatter.xml file from the Spring Cloud Build project. If using IntelliJ, you can use the Eclipse Code Formatter Plugin to import the same file. Make sure all new .java files to have a simple Javadoc class comment with at least an @author tag identifying you, and preferably at least a paragraph on what the class is for. A few unit tests would help a lot as well — someone has to do it. If no-one else is using your branch, please rebase it against the current master (or other target branch in the main project). When writing a commit message please follow these conventions, if you are fixing an existing issue please add Fixes gh-XXXX at the end of the commit message (where XXXX is the issue number).